Happy 18th Birthday to our dear friend @alphonsodaviess!!! We hope you’ve had an awesome day!!! All our best for your time with your family, the upcoming match with the #CanMNT, and your journey to Germany!!! Thank you for all you have contributed to #OurClub and for celebrating with us post match by leading #TheHumba on Sunday!!! It was good to once again join our friends in the @vancouversouthsiders’s GA section for yesterday’s match. The result on the field was disappointing, but it was great to support together! Thanks for inviting us over! We look forward to future collaborative efforts! Another season is almost upon and it’s time to take a look at the roster as we head into pre-season training. As expected, there was some turnover from the 2017 squad that was eliminated from the MLS Cup Playoffs with barely a whimper. Gone is a lot of veteran experience and some homegrowns as well. Much travelled Sam Adekugbe has now found a home with Valarenga while Marco Bustos is on loan in Mexico with Atletico Zacatepec. Fellow youngster Deklan Wynne was signed and and then traded to Colorado for Garber-bucks. Anthony Blondell – He joins the team after leading Monagas win the Venezuelan Primera Division tallying 24 goals along the way. Efraín Juárez – the newest acquisition from Monterrey in Liga MX. A holding mid capable of playing right back is like Robbo’s dream player. Seemingly versatile, but indication is that he’ll be in the midfield, potentially in a 3-5-2 formation. Interesting to note that he was an interested spectator in the 2016-2017 CCL Semi-Final when #ourclub travelled to face Tigres UANL at Estadio Universitario. As a member of Tigres’ most hated rival, Juárez found himself supporting the Caps, not knowing that one day he’d be joining the club. Brian Rowe – Acquired in a trade with LA Galaxy, he will be Marinvoic’s backup with Ousted now in DC and Spencer Richey on loan in Cincinnati. While it’s too early to tell what sort of workload Brian will have, one can speculate that he’ll at least get the Voyageurs Cup matches and when Marinovic may be away on international duty. Doneil Henry – I’m gonna cut him some slack. He was 18 when he made his debut with TFC before they started spending money wisely. Maybe his time with West Ham did him some good. David Norman Jr – Another homegrown signing straight out of the Residency Program. It remains to be seen whether he’ll end up like Bustos and Adekugbe or maybe he’ll find a way to stick. Myer Bevan – A New Zealand U20 international, his half season with WFC2 netted 3 goals in 13 overall appearances. Given a potential shift in formation, could this be the opening that Bevan needed? How much competition will he to Hurtado? Alphonso Davies – with the European giants starting to swarm, this could be a make or break year for the youngster. Marcel deJong – his play late in the season made Harvey expendable. Should provide an interesting dynamic potentially in a 3 man backline. Doneil Henry – How will he re-adapt to the MLS game and where does he fit into the pecking order? With Parker at the USMNT camp until the 29th, this may be his chance to show what he’s capable of. Russell Teibert – Does anyone know what his best position is. Brett Levis - How will his knee hold up after a full year recovering? David Norman Jr – As much as it is in his own hands, it’s also not. Even with Jacobsen’s retirement, the addition of Juarez to Ghazal, Tchani, Teibert and potentially Laba as well, will Norman even get a sniff of first team action, or he is best off in Fresno for a year? Knowing the Caps’ history, there will probably be another signing or two before First Kick. As another calendar year comes to close, we want to wish all of our internal partners and their families a very Happy and prosperous holiday season. We extend that same greeting to those who have purchased tickets and joined us, either at BC Place, or in Middle or Lower Cascadia. We would also like to formally welcome the new Vancouver Southsiders Board of Directors. We look forward to working with you in the quest to make BC Place a fortress for our boys in blue and white. We cannot wait to see what 2018 has in store. Although there is still much left to play for this season, Whitecap season ticket memberships renewals are underway, so we begin to look ahead to next year. For Partners that already have tickets with us, we look forward to another season of supporting our players. For those that are interested in relocating their seats to participate in this collective effort, please let us know. For those that are curious about acquiring single tickets, match packs, or full season ticket memberships with us, we can help with that too. In return, we expect your effort in the stands. 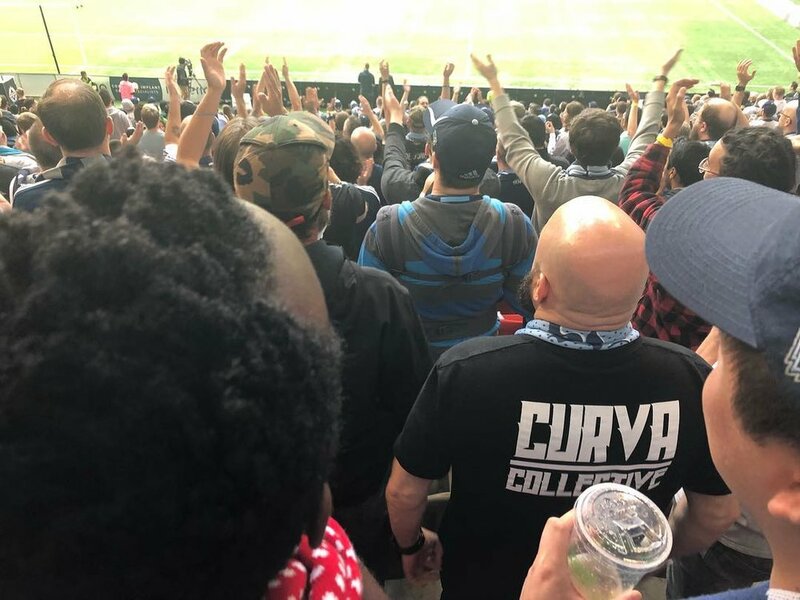 With the help of the Whitecaps Front Office, Curva Collective controls numerous rows of seats at the front of sections 203/204. Over the last few years, we have operated this as a general admission area for our Partners, with special exceptions for children, the elderly, and those responsible for tifo deployment. The benefits have been numerous and have helped create a communal dynamic. Want to congregate at the heart of the section? No problem. Are you bringing friends to support at a match? No longer do you have to scour for tickets close to yours. Going on vacation and can't attend a game? We are happy to move your tickets for you. Want to try out the section? We can make that happen. Together, we can make 2017 memorable. Now that the week is well under way, there is only one thing to focus on...our League match on Saturday. We host "New York Red Bulls"...or Dead Bull New Jersey as we prefer to call them. For some they are just a football team that was bought up by a corporation and "rebranded". For us they are one of the symptoms of modern football that should be troubling for anyone that values tradition and identity. A few years ago, @ultrasmontreal did a small display reminding everyone that Red Bull Kills. They have so far taken over Clubs in New York, Salzburg, Leipzig, and São Paulo. We get that Clubs need money, but selling your whole identity (and in some cases colours) is not worth it. Amongst supporters and ultras the world over, these 4 "clubs" are despised for what they have done or allowed to happen to them. At the beginning of this season we were disappointed to find out that this company had become a sponsor of #OurClub...again, we want our Club to make money, but we care how it is made and who it comes from. On top of all of this, it is more than awkward when you accept sponsorship from a company that is the owner of another team in your League, even in #MLS/ML$ where so much cross pollination exists. When we expressed our concern over certain red bull sponsored initiatives to those entrusted to be stewards of our Club, we were told, "It's just an energy drink." The message was essentially, "We don't care, we'll take money anywhere we can get it." It was a point we let the administrators of our Club know we could not agree with them on. So Saturday we have extra desire and motivation to lift our side to victory. If you want to support with us in section 203/204, please be in touch as we have $35 tickets for sale. We want to wish @k7ffie a Happy 25th Birthday!!! #GTK, know that we have missed you dearly this season and look forward to what is in store for you in the future. We hope you have had an incredibly meaningful day! All our best from #VanCity! #TBT to this past Tuesday evening when our players took on #KansasCity in the #CCL. Things haven't really been going our way in the League lately, so we wanted to give our players and coaches some encouragement ahead of what was an important group stage match. It was great to see our side keep a clean sheet, score three goals (making the three KC logos seem prophetic), and just generally enjoy their football. @70_tornaghi and all our defenders (Captain @kendallwaston, @tim_parker26 @sw_hakeem @brettlevis @matiaslaba @rt31bert) thank you for that clean sheet! @fraseraird was buzzing on the right wing all night! On the left it was great to see #ElBicho find the back of the net...with his head (!!!) and cultured left foot - thanks in part to set up play from @masato_kudo_official @etado19 & #MatiGol! #EMoney, your finish on #Rusty's ball over the top was inspired!!! Congrats on seeing some fruit from all of your hard work! @elraton7 & #AndrewJacobson helped put the game to bed when they came on as well. All-in-all we dined on some tasty BBQ on Tuesday! We hope all our players are able to enjoy Saturday's match in LA just as much!